I have to put a disclaimer first. All products featured here are not sponsors. I didn’t receive any payment, monetary or otherwise, in exchange of featuring said products on our blog. This is not even a review. It just so happens that these are the ingredients that I have in my pantry. With that out of the way, let’s get on with this post. Ramen. Ahhhh… It’s one of my most favorite food in the world, especially paired with a good cold glass of beer. It may not be too good for my kidneys, but it sure is good for my tummy. Not to mention my heart. It’s the quintessential soul food- simple (well, as simple as you want it to be), quick, hot, and hearty – the perfect meal when you’re feeling a little down and peckish. My brother and I always had “noodles,” the Nissin one that came in red (chicken flavor) and blue (beef) packaging, when we were kids. 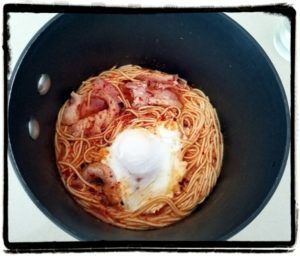 Our mother, who had limited budget would sometimes cook one packet for each of us, with two eggs dropped into the soup and cooked until the yolks have hardened a bit, for breakfast. There were countless other brands but it had to be Nissin. They were the only one that included a packet of sesame oil in their product. Before the “authentic” ramen explosion in the Philippines happened, I first had the real deal in Japan while I was an exchange student fourteen years ago (if I had a child then, I’ll be chauffeuring the kid to middle school now). My boss at one of my part-time jobs would take us out for dinner after work. The huge portions, and the sound of slurping around me took a bit of getting used to, but I was finishing whole bowls and slurping with the best of them in no time. To be honest, I still slurp when I eat noodle soups up to now. It just doesn’t seem right to eat them quietly, as Western etiquette dictates. These days, even if I can afford to eat ramen in restaurants, I still resort to the instant kind when I have no idea what to have for my next meal at home. These days I prefer the spicy Korean ramyeun for the extra kick. 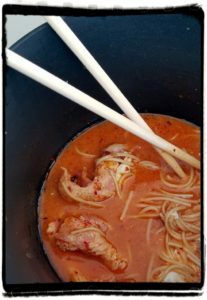 Plus, I no longer eat instant ramen as is since I’ve learned to add other ingredients as well – though never without an egg as a shout out to my mom’s version from my childhood. 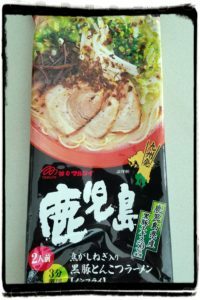 Very recently, my good friend (more like sister from another set of parents) Lenna-chan brought me Marutai gourmet ramen as omiyage. I’ve been on a diet lately so I had to wait for a carb day before I could have it for lunch. This time, I didn’t have much stuff in our pantry and fridge so I had to do with what we had. First, in a pot, I cooked two slices of thick-cut bacon. I fried them long enough to cook but not so they became crispy. I blotted some of the fat off with a paper towel before I added a clove of minced garlic and a few slices of white onion. This is my shortcut to making the broth more tonkatsu-ish in flavor. Next, I poured about 1 and 1/2 cups of water into the pot and let it simmer for about 5 minutes. 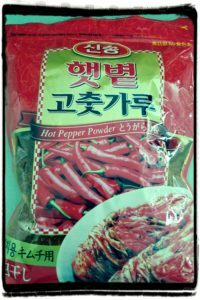 In a small bowl I mixed half of the ramen seasoning, the sesame oil included in the packet, one more teaspoon of sesame oil from our pantry, and a tablespoon of Korean hot chili powder. I then stirred this into the broth and let it simmer for another 5 minutes. Last, I added the stick noodles and stirred a bit until they’re all submerged in the broth. Once done, I immediately dropped an egg and covered the pot. I set the timer to 3 minutes as per the ramen packet instructions, after which, it was ready to eat. No bowl for me. I grabbed a pair of chopsticks (from our stash of unused take-out utensils) and had my meal straight out of the pot. Oishikatta! How do you have your ramen?